Library cards are free to residents of Van Buren Township. The items we need in order to sign someone up for a library card is a valid driver’s license or a State ID that has correct address on it and a piece of mail confirming the address. Once you have these things, feel free to stop by the library and fill out a registration form and we can get you signed up for a free library card! Also, if you are unsure whether you live in our service area, give us a call at 934-2171 and we would be happy to look up your address to see if you are or not. Eastbrook Elementary Students automatically get a free library card regardless of where the student lives! If you have a child that attends Eastbrook North Elementary then stop by the library and we can sign them up for a library card even if you don’t live in our service area! Pretty cool, right?! 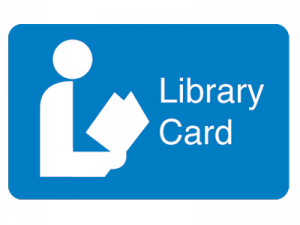 If you do not live in a library service area, then you can pay to purchase a non-resident card to use at our library or you can purchase a PLAC card (Public Library Access Card), which means you can borrow books from any library in the state of Indiana. Call the library for prices for these cards since they change from year to year. Have you lost your library card? There is a $2 charge in order to get a new library card.